When you think of Amish quilting patterns, "bold" and "geometric" may be the words that come to mind. These beautiful quilts can be seen on nearly any clothesline in western Pennsylvania and other areas of the country with large Amish populations. Yet, pieced quilts were not made by the Amish until after 1870 because they were considered too worldly. The first Amish quilts were made in a solid color, normally blue, brown, black, or rust. The fabrics were not patterned, but the quilting was often very decorative. Typical stitching patterns were curves, feathers, and grids. Over time, quilters eventually added olive green, dark red, and pumpkin to the original basic colors. The colors were always deep, rich, and without a pattern on the fabric but the way that they were pieced created the striking designs that are so easily recognizable today. Until the 1940s, the quilts were generally made from wool. During World War II, the Amish were forced to use synthetic materials. When the war was over, they began to use cotton fabrics in their quilt designs. Reading about the patterns and actually seeing them are two different things. The links below will take you to online galleries where the gorgeous colors and patterns of Amish quilts can be appreciated. The Branch Hill Joinery features a collection of quilts that make for great inspiration. PBase has a large collection of Amish Quilts. Just click the thumbnail pictures to enlarge them. Amish Country Lanes has many authentic Amish quilts for sale. The images are fantastic. The Illinois State Museum has many Amish quilt images. If you have decided to create your own Amish style quilt and need a pattern, there are many available on the Internet. Keep in mind that the patterns are secondary to the colors that are traditional in Amish quilts. Almost any pattern quilt can be Amish style by utilizing the deep colors that they do. If you plan to do it yourself, Patchwork Passion has several images of stitch designs that you can get inspiration from. 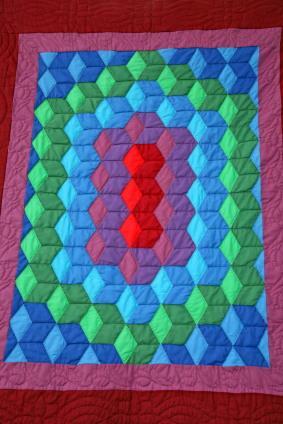 Generations Quilt Patterns has a machine quilting tutorial for first time quilters. Trusty Guides has a quilting checklist to help you plan and make your quilt. Amish quilting patterns are a beautiful and historic art form. Making these quilts is a satisfying way to express your creativity as well as connect with history.